This was a week of parties and events - tis the season! A lot of fun but made us all glad to spend Saturday night relaxing at home and sleeping in this morning. Monday we went to our neighbor's Christmas open house. We all ate a bunch of treats, kids ran around and adults talked. A lot of fun to see everyone. 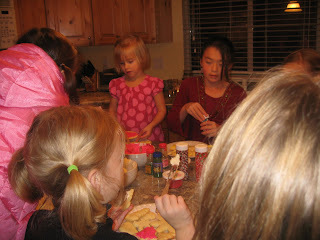 Tuesday we had our annual mom and daughter cookie exchange. 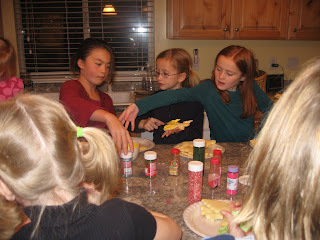 It only lasts about an hour but we manage to decorate a lot of cookies in that time! 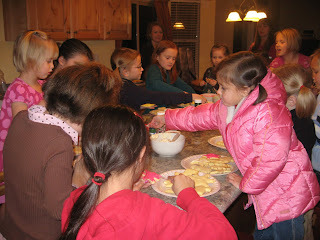 18 girls were in our kitchen decorating sugar cookies while mom's talked and swapped plates of cookies they brought. Kids think it is great because they go home with a plate of assorted goodies plus the cookies they decorated. There is a definite sugar high going on by the end of the night! Wednesday was Jeremy's birthday. It also happened to be the best day to hold an Elder's Quorum Christmas potluck dinner. It was fun to visit and we celebrated with chocolate cake/cheesecake afterwards. So I think he had a fun birthday. Thursday Jeremy went to do a photowalk of the temple square lights while Allison had Christmas craft making at Activity Days and Spencer made ornaments at Pack Meeting. Think this all caught up with me as Friday we had a date but I had caught a cold and came home early to crawl into bed. Slept for 12 hours and a big nap on Saturday and feel much better now. It is amazing to me how much I can sleep when I don't feel so great. Saturday was Robyn's big dance recital. She was so excited and did a great job. She was concentrating so hard that she forgot to smile but she was so cute. Afterwards they had Santa Clause come and Allison and Robyn ran to meet him. Spencer slowly walked over as well but is that age where he hangs back. Believes in Santa but doesn't believe that guy over there is really him. Our house was full of plaster this week as a sheetrock guy came to fix our holes in our wall. Asked if we had any cracks as long as he was there. Wow - our house was full of them. So now we have big swatches of white plaster to paint over but all the cracks are taped and some even reinforced so we shouldn't have to do this again. And in a small world coincidence our sheetrock guy happened to be the husband of Taylor's bus driver. Robyn had her big preschool polar express party this week. She got to go to school in her PJs, watch the polar express movie, drink hot chocolate and cookies and came home with a sack of Christmas projects. Taylor had a whole week of festivities. He had Santa Clause come and he gave him the funniest toy. They told Santa Taylor liked motion, lights, music and didn't want anything babyish. So they gave him a big fleece blanket and a pick up truck with 2 bobble head hunters on it and a dead deer strapped to the hood. The truck works on a sensor so when he moves by it the deer starts singing, lights flashing, truck jacking itself up and down. Robyn thinks its wonderful. Taylor spent Friday afternoon at the school Who-ville dance rocking out with an aide and came home very happy but bushed. Allison's gym teacher came out to talk to me this week. Allison I guess was not quite telling the truth when she says she can do 100 pull-ups. She can't do even one. She does a hundred with her coach holding her and lifting her up and down. So Jeremy installed a pull-up bar in her doorway and she has been working on it since. Everything else she is doing great in but until she can pull-up her own weight she won't do very well on bars. I was giving her a hard time till I tried to do a pull-up. Now I keep my mouth shut and try to remember to do more pull-downs when I work out. Allison continues to inherit my eyes as she saw the optometrist Saturday and her eyes were worse by .5 so now she is a -3. She is halfway to my old prescription and it looks like she will go all the way. We changed up Spencer's meds this week. His paranoia is creeping back in ie. if something breaks or doesn't work or he drops something it is the fault of whoever is standing next to him or talking to him etc. After a really bad 2 hour tantrum because his mini-skateboard he bought didn't have a tightener with it I called his psychiatrist. I love that his doctor does text and cell phone messages and will always call back immediately and doesn't make us have to schedule a visit first. Hopefully it will help. Makes me wonder how I personally kept it together that summer when he was so bad. At least Allison knows now just to come to me and say Spencer is really sick again, he needs to see his doctor and she takes herself off out of the line of fire. Most of the time he has been fine but the bad moments are getting more frequent. We haven't changed his meds though for 1 year and 10 pounds so I think he just needed some adjustments. The parties and excitement of Christmas just exasperates everything. Jeremy spent Saturday chopping PVC pipe in the garage making Christmas presents. We have made more of our presents this year which has been fun to do. A little stressful at times to try to get them done before this next Friday but it adds the the excitement.